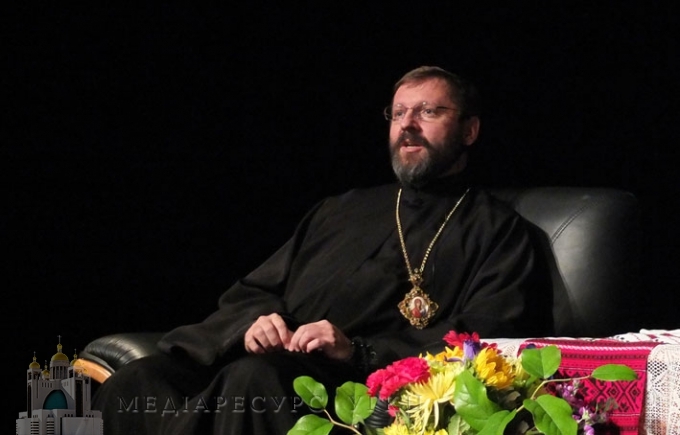 An exclusive interview with the Head of the UGCC, Major Archbishop of Kiev- Galician His Beatitude Sviatoslav (Shevchuk) to newspaper "The Word of Enlightenment» . - Your Eminence , though it has been more than two months since the consecration of the Patriarchal Cathedral Church, but I would like to start a conversation from this event. According to ancient records and chronicles of the XIX century , the construction of large temples was a significant event in the life of that time . So I dare to suggest that future generations will consider the consecration of the main church of UGCC in the capital of Ukraine to be a significant event of our time. What do you think is the place of the Patriarchal Cathedral (as an institution) in the spiritual life of the Ukrainian nation? - This question can be fully answered only in course of time. However, now we can say that on the 18 of August 2013 we experienced a unique historical event , which will be celebrated every year on the 18 of August. The introduction of this new tradition was based on the decision of the Synod of our Church. Patriarchal Cathedral of the Resurrection of Christ is a symbol , a sign of the resurrection of our Church. It had a complicated history . I, like my predecessors, take every opportunity to emphasize that we can not forget :this is the Church of Volodymyr's baptism. This Church was born in the waters of the Dnieper, on the shores of which Patriarchal Cathedral Church is now built. In Soviet times, this Church was tried to be totally destroyed and erased from the minds of the Ukrainian nation. Despite all these efforts Church revived with the will of God. Realizing that this was a great Divine event, a new church was called the Cathedral of the Resurrection. Many foreign observers emphasize that the Cathedral was built on the left bank , seeing it is a landmark moment. It is expected that the Cathedral, which was provided with a place for the structure on the left bank , becomes a symbol of unity of the Ukrainian Church and the Ukrainian nation. Its body was cut by various rivers - the Zbruch , the Dnieper. Unfortunately, today it is often spoken about the Rightbank and the Leftbank Ukraine , although we are all children of one nation . Do not forget also that the Ukrainian nation is present on all continents. Now, more than ever, our nation needs a core , which would be the center of gravity and the center of the world Ukrainian unity of all Ukrainians , regardless of the place of residence and religious affiliation. As the slogan that was born spontaneously in preparation for the consecration of the Cathedral, were the words : " the Cathedral unites all of us." - Lord grant that these words become prophetic . Were there any events that require special accent during the preparation for the consecration of the Cathedral and the consecration itself? - At the occasion of celebration of the consecration of the Cathedral and the 1025th anniversary of the Baptism of Ukraine was a pilgrimage to the Patriarchal Cathedral. There was the third possibility for such a pilgrimage –the Year of Faith, which was proclaimed by our Church. In those days over 20,000 pilgrims from around the world came to Kyiv . I personally met with different groups from Argentina, Brazil, USA, Canada and many European countries, Russia, Kazakhstan and Belarus. This was the event that was commonly recognized and went far beyond the Catholic Church. Holy Father Francis sent his personal legate - Archbishop Emeritus of Vilnius Cardinal Bachkis. The presidents of episcopal conferences of the U.S. , Canada, representatives of the Polish and German bishoprics , all Eastern Catholic Churches of Europe arrived. The presence of ordinary of Greek Catholics in Russia, Bishop Joseph Werth and leader of the Catholic Church Belarusian Father Sergius Hayek was a very symbolic moment. Then we saw something that will impact the future of the Christian world , regardless of the country or rite of confession. - The presence of such persons Church feast - is an expression of respect to the Church , an expression of respect for the Ukrainian nation state or just a celebration of a historical event the 1025th anniversary of the Baptism of Rus- Ukraine ? - I perceive it as a sign of respect for the resurrected Church. UGCC is now a powerful factor in church life far beyond the border of only one nation and one country. To our feast of consecration of Patriarchal Temple Church Roman Catholic bishops from countries where Ukrainians, who are united around their church, are an important social factor, came. The presence of such persons is recognition of the role and place of the UGCC in global terms. - Why did UGCC choose August 18th not last week of July, when the anniversary was celebrated by Orthodox Church to celebrate the 1025th anniversary of the Baptism of Rus- Ukraine,? Was it due to technical or organizational reasons or maybe some other details , which are not talked about ? - Our Bishop recalled that the memory of the baptism of Rus- Ukraine has long been linked to the day we celebrate the memory of the martyrs - August 14. To tell the truth, I do not know when this tradition established in our church. This day Dormition Fast begins and it is the day of so-called August water blessing . It is this water blessing that preserved ancient Kyivan tradition of commemorating of the event of Rus- Ukraine Baptism. Deciding on the date of the anniversary celebration of Baptism, we took into cosideration a deep understanding of the traditions of our Church. To this date I called the next Synod of Bishops of the Church , which took place in Kiev. On the first Sunday after this day the Patriarchal Cathedral was consecrated . - Now both UGCC and the Orthodox Churches remind us that we came from a single Volodymyr's font. What is the main reason that the Church , that is, the children of the same font, are still decided? Not only during the visit of the Pope to Ukraine in 2001 but also today many religious and political leaders often call UGCC "the Galician Church ", which is on someone's " canonical territory ". This is said because of the ignorance of history or common political speculation from the same category as the " statement" about the Ukrainian language as an " Austrian political project "? - When it comes to single but divided Kyivan Church , we must remember that these divisions are the result of so called historical scars on the body of our people. Each division had its historical context and its causes. Currently, there are practically four churches that are rooted to Baptism of Saint Prince Volodymyr. This is our Church , the Ukrainian Orthodox Church which is in communion with the Moscow Patriarchate , the Ukrainian Orthodox Church of Kyiv Patriarchate. And do not forget about the Ukrainian Autocephalous Orthodox Church. When talking about those Kiev branches of Christianity , de facto we tell about certain historical dimensions of a single body. My predecessor , His Beatitude Lubomyr (Husar ), returning as the head of the church to Kyiv , delivered a program sermon called "United People of God in the land upon the mountains of Kiev ." In his speach he proclaimed the reasons for his return to Kyiv , and then outlined the way to assess the inheritance that each of its parts of once united Church of Kyiv gained during its existence, and how to aim to desired unity. And His Beatitude taught the essence of that unity. And the labels that are given to this or that church , including ours, are of ideological nature. I would not say that the ideologists are under the influence of ignorance, because according to moral principles ignorance make us free from responsibility. I believe that here we deal with intentional ideological actions or conscious underestimation of dignity of this or that church. Here I again want to speak of the sermon of His Beatitude Lubomyr. He said that very often in different historical moments the Church was tried to use as a tool for certain geopolitical reasons of neighbors. A necessary step to restore the unity of the Church of Kyiv is the need to assess the fact of religious freedom , which all the churches have in the independent Ukraine. Only when the Church is free from politics, when the Church is a true church in a free united independent state, realize the value and independence of their country and the cost of their freedom , then we will have the historical background to the be united. - Once Bishop Basil ( Medvit ) in sermons and in interviews emphasized that the association of churches may happen sooner than we think . "It can happen in my lifetime ," - said His Beatitude in the first years of this century. Do unification processes become reality? - I want to remind you that 5-12 June 2013 Cardinal Kurt Koch, the president of the Pontifical Council for Promoting Christian Unity was in Ukraine. Since that visit took place on the eve of the celebration of the 1025th anniversary of the Baptism of Rus- Ukraine , it was not the media highlight , but I have a reason to call it a landmark. Visit of Cardinal Koch brought up a question of finding unity among Christians to the spotlight of Ukrainian society. Moreover, on the day of the visit the fact of separation Churches in Ukraine was clearly visible. During the visit , among other measures , a round table , where the members of the public , scholars , active laity of various churches were invited, took place . And what did we , the representatives of different branches of a single once Kyivan Church, see ? We have seen that the issue of church unity is irreversible. I declare this with great confidence. The need for unity is a spiritual need of the faithful Christians in Ukrainian . - How does the said above spiritual need for unity manifest itself? - When talking about the Orthodox side , we can see how our Orthodox brothers are tired of the existing division among them . We see how seriously they want to step within their own circle. The second step is obviously to be the question of unity of all the branches of Kyivan Christianity . As Ukrainian Greek Catholic Church is increasingly recognized as a necessary partner to achieve unity. Until recently, it was not. And when talking about one national church in the Ukraine, a Unified Autocephalous Orthodox Church is ment. We were simply dropped from sight. Now everybody realizes that our Church is a catalyst and promoter of such a unity. The third point that I realized after those meetings, is that not only public understanding becomes more profound , but the government becomes aware that the Church is not a human institution , which can impose unity through diplomacy , some agreements or orders to create one Church artificially. Church is not a human creation but the body of Christ. Therefore, with God's will events, which seem strange and unexpected in human perception, can occur. l agree with these words of Bishop Vasyl. Although the human mind cannot percept the prospect of church unity, which seems far away , but events may occur that will surprise us all . What kind of events these can be, of course we do not know , but we must always pray for our unity . We have to build it in spiritual terms. If every Christian in his personal and spiritual live will be at least a little closer to Jesus Christ , who all of us believe in , then we get one step closer to our neighbour. - When we speak of Christ's Church, when profess signs of the true Church in the Credo , we say (here I want to emphasize that everyone says! ): " I ​​believe in one, holy catholic (or catholic ) and apostolic Church ." This means that the church community is not only a vertical dimension , that is the relationship with God , as stated in the question. It also has another dimension - dimension of oecumenical. This means that the local Church must not only have faith in God , but the relationship with its brothers in the faith. Canonicity is not pleasing or unpleasing to God but in communion with the universal Christianity. I will not comment on who , basing on the Orthodox understanding, falls under the concept uncanonical and what are the criteria for this . This is the question of Orthodox theologians and hierarchs. The fact that the UOC-KP is not recognized by other Orthodox national churches. However, there is also the fact that the hierarchs of this Church are actively seeking such a recognition . There are some arguments , as this Church understands the need for communion and oecumenical measurement of their Orthodox community. This element is very important. I really wish our Orthodox brothers unity of their community , unity with God and communion with the Ecumenical Orthodoxy. There are many obstacles to building a local church in Ukraine without unity. And in particular there are many obstacles to development of the Orthodox- Catholic dialogue in Ukraine and international dialogue too. I emphasize that the unity of Ukrainian Orthodoxy is vital to all Ukrainians , regardless of religious affiliation. - The human body is dead without a soul. As a society without spiritual life dies. As Ukrainians are Christians, then society life is dead without Christianity. During the recent political history we have seen many examples of spiritual dying . The effects of the state we still can not overcome. There are many public figures, who are different from those brought up on the value system of Lipinsky, see the place and role of the Church. There are those who do not want to see the Church and want that the Church to be absent from public discourse. Unfortunately, we have to be prepared that such trends will grow , which is a sign of secularization of society. Such processes take place not only in Ukraine as a post-totalitarian state, but in many countries, we used to call democratic. We can not dissociate ourselves from these processes by laws, boundaries , political or economic union. We promote the active presence of the Church in civil society. And not because someone in the hierarchy wants it. The Church is called to be a mother and a teacher . When the Church expresses its position on various political processes , it is not an interference in the politics. It does not attempt to take control of this or that political party or any political authorities . The main task of the church is to proclaim the eternal truths upon which our common Ukrainian House should be built. Here let us recall the fundamental message of Metropolitan Andrey Sheptytskyy "How to build a native hut ." In my opinion , these messages are extremely important for our present church life and socio -political development. Today, the Church and other religious organizations (I mean the Jewish community of Ukraine, Ukraine Muslim community , etc. ) create together a very interesting social organization - the All-Ukrainian Council of Churches and Religious Organizations. It, as the some experts observe, is the largest and most influential NGO. And when we along with fellow brothers from other churches occupy a social and political position or giving of any evaluation of the phenomena in our society , we are a powerful social and moral authority. And that is what Ukrainian society expects from us . Does everybody listen to this voice ? I have the reason to believe that the public listens . Do political structures and authorities listen to this voice? Unfortunately, not always and to full extent. Although opinion of AUCCRO is taken into consideration. We are aware of the role of church leaders should play in the life of the nation. I had a meeting with Minister of Culture Leonid Novokhatko . Currently, the Ministry of Culture of Ukraine – is the part of the government, which is responsible for the religious community. I presented minister a summary of developments of religious communities of the past 10 years. The document is called " Fields of church-state relations in Ukraine." We said that the religious component is a very important part of society and its moral foundation. The urgency and the need to preserve the Church in the public discourse will gain specific acuteness and weight after the signing of the Association Agreement between Ukraine and the EU. We understand that the process of secularization will constantly grow in Ukraine . Hence the concept of church-state relations is extremely essential to maintain the moral authority of the church environment for Ukrainian society. On the one hand, the state should be secular , ensuring equal conditions for life and development of all faiths. On the other - the constitutional duty of the state is to ensure all rights for religious freedom. Impermissible marginalization of the religious factor that was present at the time of the Soviet Union (and now it is as " the phenomenon of" secularization, rolling world again) , because it is a threatof reduction or denial of the identity of the Ukrainian nation as a Christian nation , as a deeply religious nation. - You emphasized that the current Council of Churches and religious organizations is of high authority in society . However, a small portion of the faithful participate in Sunday's liturgy. In Lviv a figure that is less than a third of all residents was named. The farther to the east this number decreases. Five percent was the figure most talked about . But October 27, 2013 , Bishop Boris ( Gudziak ) claimed two percent. How to correlate these figures with the authority of the Church, with the authority of the Council of Churches of what you have just said ? You constantly emphasize in preaching and in interviews that today Ukraine needs a new evangelization , which Pope Ivan Paul II spoke while he was in Ukraine. How can you make it when a small percentage of society goes to church? - ... When I visit our communities in towns and cities of Kyiv archdiocese I often see one hundred percent attendance in worship . Although these communities are often small. The issue of the new evangelization can not bother us . Today we face the question of finding out how to make a person to be open to the presence of Jesus among us, in particular, in the context of the Divine Liturgy. This is a delicate issue. Cultural changes that currently influence modern humans , affecting not only their outlook, but also a model of relationships with other people. Once people gathered together to meet. Now you just start your computer to meet. Social networks are replacing social life. This is a phenomenon of our time. We understand that in order to make worship available to people we should go out to meet them. We cannot calm ourselves down that they come to us . We need to meet the modern man. In different ways. Starting from the fact that we talk to people by means of the media. Now our Church clearly states that the media is an essential tool for the proclamation of the Gospel of Christ . This is radio, and television, and newspaper interviews. And that I speak with the community of readers of "Words of Enlightenment " via your mediation is a necessary element of Ukrainian New Evangelization . In terms of people's access to the Church an important issue is the construction of temples. Now in Kyiv 21 UGCC Communities are registered. However, there are only four places of worship - the Patriarchal Cathedral, Temple of Basil the Great in the Lviv Square and two chapels - by Askold grave and chapel (the bell tower of the formerly destroyed temple ) of Nicholas the kind in Podol. A lot of people do not have the physical opportunity to participate in worship, it is not easy to overcome distance. So we have to get closer to them in some way. When it comes to Kyiv , there are many questions . We are trying to understand what modern man requires how to reach him, how accomplish effectively our ministry and our preaching in the new circumstances in which we live today . - From history we know that “Prosvita”, which was established 145 years ago, and the Church are closely connected. Often priests were the founders and leaders of“Prosvita", and founded schools. Comes to mind Father Ivan Wan’o –the founder of the famous Ukrainian school in Rohatyn . is now the cooperation of the Church and the “Prosvita " effective enough? And how do you see this collaboration in the coming years? - If we talk about the second half of the nineteenth century, the first half of the twentieth century , “Prosvita” was the step outside the walls of the church , which I said about, referring to new forms of service to the Church . We know the realities of rural Galician of 20-30 years, there were two community centers - churches and reading rooms of “Prosvita”. It was a step towards people which then , under the rule of a foreign country, the Church tried to make, including maintaining and sometimes creating and leading centers of " Enlightenment ." Now I take great pleasure in watching as “Prosvita” is reborn in the independent Ukrainian state. I have had the opportunity to meet with members “Prosvita” in our diaspora , particularly in Argentina. Well I understand how important the role of enlightenment , which is central to Ukrainian identity revival and preservation of which - the main task of the modern“Prosvita”. However I want “Prosvita” to achieve its goal by implementing an idea that can be traced in your questions , and I want to remind one of the blessings that is proclaimed by the high priest during the episcopal worship : " O Christ , the light of truth that enlightens and sanctifies every person that comes into the world . " So Christ is light , He shines . If“Prosvita” wants really to shine people, it must be a partner of church. I met with members of “Prosvita” in Ivano-Frankivsk . I remember a meeting in the residence of Metropolitan Vlodymyr. Such cooperation is necessary. Though its shape may be different in different parts of Ukraine , different in different countries where Ukrainians live . We encourage the cooperation between “Prosvita” and our church organizations to take place primarily at the local levels for members of “ Prosvita” to be an integral part of the local church of that diocese in which they operate, of that parish to which they belong. And such a network can become the foundation for building a broader cooperation. - It has been more than six months since Cardinal Jorge Mario Berholyo was elected Pope. During this time, he has gained great sympathy in the world ( not only among the faithful Roman Catholic rite ). You know the cardinal before he was elected Pope. Are the actions of the current Pope something that is a surprise to you ? - After the proclamation of the newly elected Pope a press conference for Ukrainian media who were present in Rome was convened. Then I said, we expect many surprises. And the first months of the current pontificate of Pope confirmed my intuition. There were many surprises. Not only as for the style of the new Pope. This style is very direct , the style of a pastor, who is close to the people. He may make a surprise by stopping to go to the cafe for a cup of coffee while walking in Rome. He bought sim-cards for the victims of the tragedy near Lampedusa . The current Holy Father called to a woman who was going to have an abortion , and prevent her from the sinful idea. He told her : "I will baptize your child ." The determination with which he undertook the reform of church structures , including the Vatican curia, surprised. Two weeks ago I , as a member of the Pontifical Council Ordinary Synod , participated in the meeting of the Council. The Pope came to us, was with us almost the whole day and proclaimed 2014 extraordinary papal synod on the Christian family. It's all a surprise , because this is an extraordinary session of the Synod , which sets a new tone for Church. And this solution requires from me personally very intensive work. - I hope rulers will hear the Holy Father. Anyone who seriously thinks about the future , should build a culture of life. And just out of the mouth of the successors of St. Peter words of life are heard. Anyone who wants to have future , should heed the words of the Holy Father. - I understand that you have send an invitation to the Holy Father Francis Pope to visit Ukraine and it has been accepted. Now, as the experience of the visit of Pope John Paul II to Ukraine shows, a " trifle " remains to solve the problem on the levels of the government and diplomatic body. Has something already been made? When, in your opinion, Ukraine will experience a unique day of meeting with the Pope in my country again? - Thank you for your very thorough answer. - Thanks to you. May God bless all of your readers who will read our interview . And let it be one more means of so necessary to all of us evangelization.